As we head into the holiday season, this study is a good reminder that cell phones and driving (and even listening to conversation while driving) has its risks. Using a driving simulation setup, Marcel Just and his colleagues saw that listening to sentences robbed from visual and spatial areas necessary for driving. This is also why hands-free phones are really not any better than conventional cell phones. The problem is not just having to hold the phone, it's diverting the brain's resources for visual and spatial awareness. People have been driving with and talking to passengers for as long as there have been cars. I wonder if cellphones aren't more problematical because you have to take the bits of brain that should be used for watching the road and other drivers to imagine the person on the other end of the phone. You don't have to imagine the person who is sitting in the passenger seat. So maybe it's more the talking to someone who isn't there than talking at all. I listen to books in the car all the time and I don't find that they cause me to lose focus on driving - it's much more likely I lose focus because I'm woolgathering. There was a study that showed that talking to passengers in the car was not as big a problem as cell phone use or even hands-free. The reason for this was that a passenger in the car (presumably adult) was more likely to pause at appropriate times when traffic became more complex or the driver had to make turns or take other actions. Books may be easier to listen to than say high density new informational content where more precise data is relayed per word (most fiction books have plenty of description where significant details can be missed, but the gist still processed). It is true that what most people think they're doing while multi-tasking is not true multi-tasking...rather the brain needs to switch between tasks not carry them out simultaneously. In order to switch well, one needs sufficient working memory to keep the other task holding while focus and attention are switched to the other. 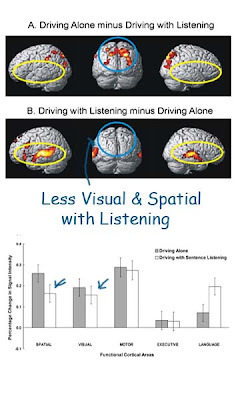 Some people manage this in the car with good procedural memory (keeping the car driving where it should) - others have a good tape loop so they can replay recently spoken information and catch up with the conversation when driving permits.